On the cover: Small has hit the big-time. Cellphone imagery by Andrew Pothecary. Original portrait and feature photos by Jun Takagi. 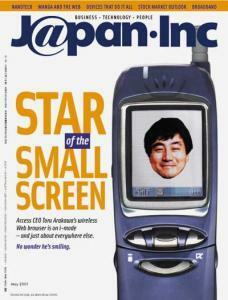 When he launched Access about two decades ago, CEO Toru Arakawa knew that today we'd be living, working, and playing through small, Net-connected devices. Now he's a star of the small screen. Businesses have sprung up, rents have increased, and a prestigious new resident has moved in: Reality. Consumer devices in Japan are merging like never before. We share some of our favorite examples of the converged appliances working their way into the fabric of Japanese society. Manga will probably always be huge in Japan, but they're having to adapt to the rising use of PCs and Net cellphones. The top keyword searches done by i-mode surfers differ significantly from those done by regular Web surfers. The cellphone wants to be a gaming platform. The makers of handheld game machines are reacting accordingly. Hope you're feeling "three bars genki" despite all the "banzai commuting." A wireless advertising experiment offers shops and restaurants a new way to attract passersby. Are the e-com kiosks in convenience stores popular? Nope, and if they were, it'd be damn inconvenient. Anonymous panelists from the accounting, securities, and consulting fields theorize on the matter. Taking advantage of deregulation, the founder of telecom carrier ACCA Networks aims to bring DSL broadband to the masses. The managing director of Hokkaido Venture Capital is a supplier of ideas, funding, and caffeine to "Sapporo Valley." This month: The preferred broadband technology, surfing on the company dime, paying for i-mode content. Ascertaining the correct reading of Japanese names may seem arcane, but for developing unduplicated direct mailing lists, it's vital. The bizarre properties of ultrasmall structures could turn today's tech scene upside down. Japan's nanotech players, predictably, are on the cutting edge. Veryan Allen gives us the straight dope on investing in Japanese securities. An executive summary of where the markets have been, where they're heading, and how to invest in them. i-campus is hoping its Web-based learning system will go over well in Japan. With lifetime employment fading away, there could be a need for this kind of service. This month: E-Timing, AboveNet Japan, Giga Networks, Index Digital, Capion, and 724 Solutions. A look at Miwa Yanagi's computer-surreal My Grandmothers series, where future grandmothers live serenely even as the world is ending. Email is changing the Japanese workplace and making people nervous in many interesting ways.